It’s official. I am an elephant magnet. Among over 30 people here on this Tropical Biology Association field course, I’m still the only one to have seen elephants in the forest. Three times. This last encounter was by far the most unsettling. Most of the forest close to the research station here in Kibale is logged, and of the primary forest that remains, the majority is on steep rocky slopes where extraction of timber would have been impossible. I was getting a little frustrated at not seeing any tall-stature primary forest, but that may be because the forests here seem to be relatively young. Yesterday afternoon I decided it was time to extend the range of my excursions and, following a tip-off from one of the local PhD students, I copied his GPS base maps and headed to the southeast, descending in altitude most of the way. At one point I almost walked into a large male chimpanzee. Crossing a boggy patch at the bottom of a gorge and watching where I was putting my feet, I was already quite close before noticing him. Startled, I scampered back a few paces then looked to see how he would respond. Not a twitch. He cast me a laconic, disinterested glance, then continued grazing on a bush. I managed to take a couple of pictures before he moved on and allowed me to pass. I’m used to meeting orang utan in the forest, when that kind of proximity to an adult male would be a dangerous situation. It’s taking a little time to adjust to how habituated these chimpanzees are. 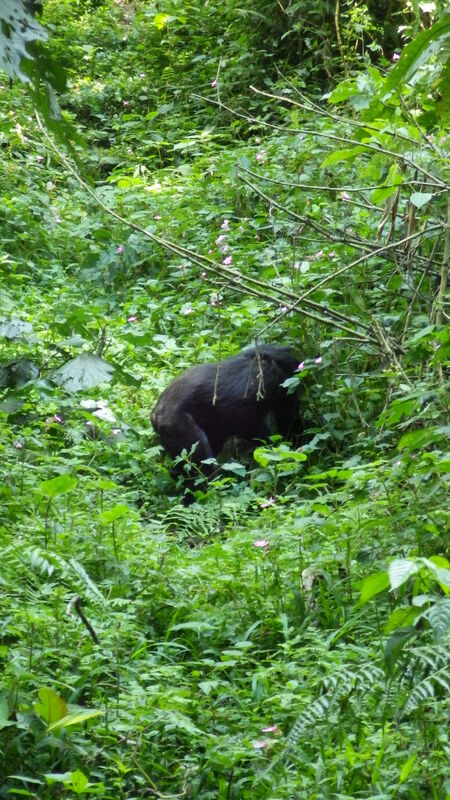 A large male chimp finally decides to vacate the path in front of me, in no particular hurry. Eventually the trail ended, running into a larger orthogonal path that looked like it would connect with one of the main tracks through the reserve and give me an easy trip home. This led me for a mile through some beautiful dry forest which looked to be infilled savannah dominated by Olea trees. 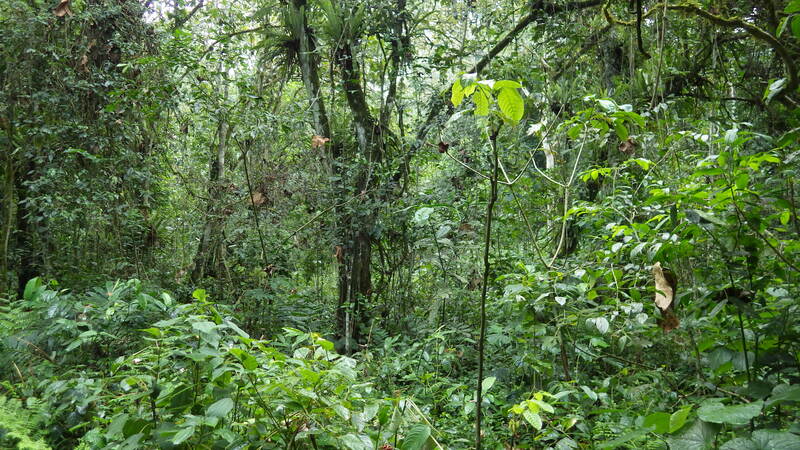 It had a nice, open understorey and some lovely views to forested ridges beyond. Having taken two hours to get out there I was tired but it was worth the effort. Hill forest dominated by Olea trees with some spectacular lianas. Definitely worth a two-hour hike. Sadly my chosen trial petered out, or rather it turned into a delta of narrow interweaving and overgrown paths through tall spiny Acanthus thickets. I knew the main trail was only a few hundred metres away, but it became increasingly obvious that the paths I was using had not been made by humans. This was exactly the kind of vegetation in which I met the elephants the first time, and visibility was only a few metres. Keen not to take many risks so far from base I turned back and retraced my steps for a few miles. The outbound trip had been over some demanding topography, but there was a ridge trail to the north that was wide and easy-going, so I took a side trail up to meet it. On the way I passed an elephant wallow and a salt lick, which meant my senses were already tingling, but it didn’t look like there had been any activity there for some time. Nevertheless I was proceeding with extreme caution. Meeting the ridge trail was a relief, though this was soon dispelled when I found a fresh pile of elephant dung. The ground was dry so there was no definitive way of knowing whether they were ahead or behind me, and this trail was the most efficient and direct route home. I proceeded with extreme caution, practically on tiptoes, listening constantly for any sign that there might be elephants nearby. There were broken branches and a characteristic stench that I’m belatedly coming to recognise. The problem was the trail, which had high banked walls with thick scrubby vegetation on each side. It didn’t offer many means of escape. Rounding a corner I suddenly found myself metres away from the backside of a large male elephant. My heart was already pounding, but fortunately I had seen them before they saw me, and I was still walking as silently as possible. I crept back a short way then walked briskly back down the trail, putting some fast yards between myself and the herd. It was only when I heard movement — and they were out of sight — that I broke off the trail and sped into the forest. This stuff is no fun to run through, especially with elephants on your tail. The forest was filled with thick undergrowth on a steep slope, but I knew that my best course of action was to head west and get to the other side of the valley, so I aimed for the sun and pulled out my machete. I dropped right back down to the valley floor, waded through the swampy vegetation (if I’ve picked up mango flies I’ll be very displeased), then hacked up the other side. Here the GPS came into its own as I was able to eventually pick up another main trail on the next ridge which led safely back to base from the other direction, completely circumnavigating the elephants. Overall the diversion added several hard miles to the return journey. I made it back at dusk, shaken, soaked in sweat and exhausted. I then bought a beer. Surely this can’t keep happening to me? One of our students had a memorable though less pleasant encounter with the chimps. While measuring one of the liana plots, the chimp troop came past and the group of students decided, quite reasonably, to down tools and watch. One of the girls stood on the trail directly beneath a pair of chimps engaged in enthusiastic congress when a small deposit of something warm and slimy landed on her cheek. By all accounts this was not well-received. In all the millions of years for which our two species have shared this planet, how many times do you think that has happened? This entry was posted in Uncategorized and tagged elephants, field notes, forests, Uganda on August 30, 2015 by Markus Eichhorn. Reblogged this on Tropical Biology Association.